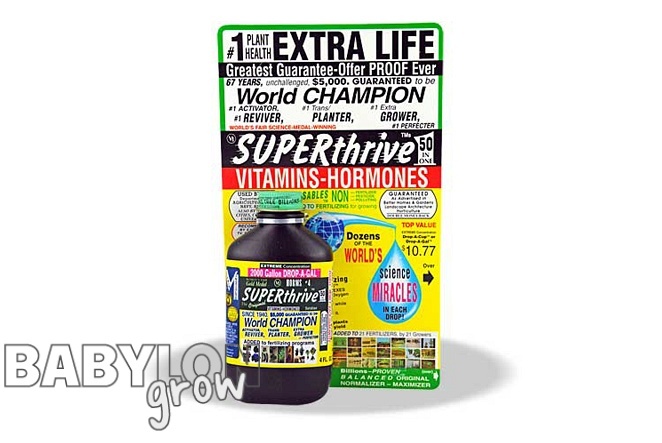 Product code: GRO1186 Videó: How To Hydroponics - S02E03 Does SuperThrive Really Work? Unique World's Fair Gold Medal super thrive gives easier plant success worldwide. Used by countless government, university, commercial, and residential growers. Guaranteed best, unchallenged since 1940. Its non-toxic, ready-made vitamins and plant hormones normalize plants. Add to fertilizer program. It stretches the dollar. Used for best plant health, extra life everywhere. Saves tress and speeds better crops. Beautifies flowers. Enables plant success when over-wet, over-dry, over-dark, over-light, over-hot, over-cold, over-saturated with sea water or sea winds, over-buffeted by wind or people. Heals open plant wounds to aid in preventing fungus invasion; strengthens plants to aid in reducing attraction to some pests. Speeds germinating and development of seed cuttings, bulbs and plants. May save years of waiting for harvest ability of fruits and nuts. Improves fruits and vegetables. Uses up constructively excess fertilizer. Improved root system reaches maximal soil fertility.